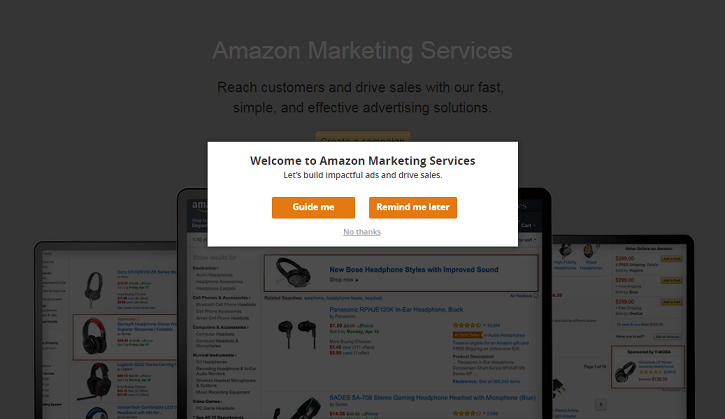 Vendors now have a little more help getting started with sponsored ads (formerly Amazon Marketing Services). Our new feature, sponsored ads Step-by-Step Guidance, walks users through the process of creating an ad campaign. For vendors looking for extra assistance, this interactive guide offers more of a “hands-on” feel than traditional help content. At each step of the ad creation process, users will be provided recommendations without having to ask. Easy opt-in: This step-by-step experience starts as soon as a user logs in. Simply click “Guide me” to be guided through a campaign for Sponsored Products, Sponsored Brands (formerly Headline Search Ads), or Product Display Ads. It’s easy to turn off the instruction at any time for advertisers to progress on their own, and it can be reactivated by using the light bulb icon in the top right corner of the screen. Recommendations at each step: Step-by-Step Guidance offers advice throughout the campaign creation process, so first-timers can get suggestions as they start out—and advertisers of all experience levels can learn best practices. Centralized resources:The help section has expanded into a resource center that includes additional tutorials and recordings of previous webinars and is accessible via the light bulb icon. Extra tips: Additional information pops up when hovering over the question mark icons, letting users learn more about how to get the most out of sponsored ads. The advice provided in Step-by-Step Guidance was developed by our product experts and includes learnings from the actual experiences of other vendors. The development of this resource is part of our ongoing dedication to make advertising approachable, straightforward, and effective. Any vendors who might have found the advertising console (formerly Amazon Marketing Services) intimidating before should find this updated version easier to tackle. Try out Step-by-Step Guidance today by creating an ad campaign with the advertising console.